Covencraft book 2 Udpate – First draft done! OMG, guys! I just finished the first draft of Book 2 of Covencraft! Now comes the next steps – EDITS! I admit, I HATE editing. But I’ve promised Fable Press they will have the book by January 15, so there’s no time to waste if I want it to be read over by my beta readers in time! So I’ll have a celebratory drink tonight (and by drink, I mean bottle of wine) and then tomorrow, I start editing from the beginning. I already have some notes on things that need tweaking, and I’ll be checking my SPAG as I go. Then it’s off to Donna, Chantal and Ash for review. Although, Donna already has a rough draft without the ending that she’s looking at right now. She’s doing the “Yo, does this have a plot?” read through. I’m always so happy when I finish a draft! It makes all the really tough parts (the crying, the wailing, the despair, the teeth gnashing, the fingernail biting, DID I MENTION THE DESPAIR??) worth it! For all of those people who wonder, WHERE DO WRITERS GET THEIR IDEAS, today I bring you REAL WORLD INSPIRATION. One of my coworkers sent me this link today and I LOVE IT. 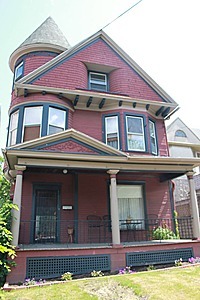 Here we have a breathtakingly beautiful Victorian home for sale. Now, let’s take a peek at the blurb, shall we? Built in 1901, this Victorian home in the Hollywood section of Dunmore features 1850 sf of living space with an additional 1350 sf of partially finished space. Original hardwood floors throughout entire home. 4 bedrooms, 2.5 bathrooms. Off-street parking. Freshly painted. New moulding throughout entire first floor. Slightly haunted. Nothing serious, though. e.g. The sounds of phantom footsteps. A strange knocking sound followed by a very quiet (hardly noticeable, even) scream at 3:13am, maybe once a week. Twice a week, tops. And the occasional ghastly visage lurking behind you in the bathroom mirror. Even still, this occurs very rarely and only in the second floor bathroom. First floor features: Large living room with an open staircase, stainglass window and a large picture window. Large dining room with bay windows. A study/library with another stainglass window and a secret door behind a moving bookcase which leads into a small office. Kitchen features gas stove top, built-in oven and built-in dishwasher, tile counter top. Stairs leading to basement and a rear staircase leading upstairs. Also has enclosed porch/mudroom. 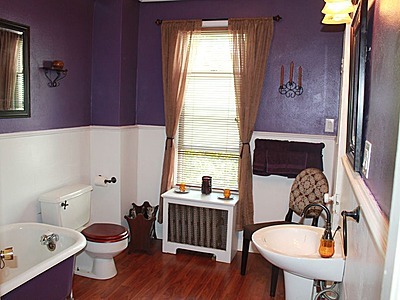 Full 1st floor bath, very nice tile work and fixtures. 9 foot ceilings throughout 1st floor. Second floor features: 4 bedrooms. The 2 front bedrooms are separated by double louvered doors. Perfect for a Master Bedroom/Nursery set-up. 3 tall windows in each of the 4 bedrooms. Huge 2nd Floor full bath with large Victorian bathtub and very large closet. Large unfinished crawl space behind concealed door hidden in bedroom closet. Very strange area, but perfect for storage. Rear stairs leading down to kitchen. Stairs leading up to huge attic. Huge walk-up attic is partially finished. Spray-foam insulation, wired and three quarters of the way drywalled. Can easily be completed for an additional 400sf of living space. Very tall vaulted ceiling, dormers, 4 windows and rounded turret section (one of the coolest features in the whole house.) Basement features very large wet bar. Has sink and built-in tap system. Very large space and high ceilings. Basement has nice layout and can also be converted into living space. Also features a half bath. All around a beautiful home with lots of updates and tons of charm. Must see. I CAN’T EVEN MAKE THIS STUFF UP!! I don’t know if it’s legit or if they’re just fraking with me, but either way, this listing is my TOP PIC. I’m just not sure if I want to call the Ghostbusters or hire some teenage kids and dare them to spend one night in the haunted bathroom, while video taping them and turning it into a mockumentary. Some say the object is magic, but others say the better word is cursed. It brings inanimate objects alive, forcing life into their bits and pieces. Corrupting nature’s work, making things move and shift where before they were lifeless. It brings to life a creature that cannot stand the sun – a lumbering, dripping thing that leaves bits and pieces of itself behind wherever it goes. It likes children most of all. As is often the way with children, they don’t realize they are in danger. They don’t see the beast for what it is. They see a plaything – an exciting new toy that wants to jump and dance with them. They are happy. They don’t know any better. Its heavy footsteps fall on the ground – thump, thump, thump. The deep tone leaving a sick feeling in those nearby – rubbing at their chests as if they could purge the sensation. Until the sun rises. The glorious sun, burning away the effigy, the wrong-thing, the perversion until all that’s left is a soppy, sodden mess. Points to all of you that recognized this as FROSTY THE SNOWMAN!! !